.....Elsewhere in this newsletter, you will find information on the availability of several options for the Quickie. .....The 22 h.p. engine modification kit will also permit an increase in gross weight to 520 lb, allowing a standard useful load of about 270 lb. This increased useful load will allow full fuel (700 miles), 30 lb of baggage, and a 190 lb pilot to be carried. The new performance figures will be published with the kit, but one can expect a 140 mph top speed, 600 ft/min rate of climb, and 450 ft. takeoff distances. .....Even though these modifications will thrust the Quickie performance wise into the 180â200 h.p. general aviation aircraft class, we are not content. Therefore, we are investigating the possiblity of supercharging the basic Onan engine. This Phase II program will take several months and may result in the engine being rated at 25 h.p. from Sea Level to 12,000 ft. This new program will complement the 22 h.p. kit. Performance with the Phase II modifications will he so staggering, that we will not publish any performance estimates until we have verified them in flight testing the configuration. The Phase II modifications will again be retrofittable to any Quickie engine in service, and, for maximum performance, the Phase I 22 h.p, kit components will need to he installed also. No further information will he released until some dynoâtesting and flight testing have been accomplished. 1. Kevlar Engine Mount — The optional Kevlar engine mount is a specially laminated piece built to QAC specification. It is exactly the same size and shape as the standard aluminum mount, and is, therefore, interchangeable with it. Kevlar has a damping ratio over 15 times better than aluminum. It is recommended for the ultimate in smoothness from your Quickie powerplant installation. We have had one on test for over 200 hours and can attest to its qualities. 2. 22 HP Engine Modifications— These modifications to the basic 18 hp Onan Quickie engine will yield a 21—22 hp engine. All parts have been verified through exhaustive flight test and dynomometer testing. All parts can be retrofitted to any 18 h.p. Onan Quickie engine now in service. The kit will consist of a new exhaust system, modified cylinder heads, Kevlar engine mount, Reworking of your propeller may be necessary. The kit will not be factory installed, since Qa racommend at least 10 hours of runing on the engine before installation. See the Engine development section for further information. 3. Large Tire Option - This modification consists of larger wheel pants to house 12.8” tires and five inch wheels, a revised braking system for increased effectiveness,a revised tailwheel,and complete plans to install and make all necessary components. This option is retrofittsble to any Quickie and has been extensively tested in Canada on grass runways. 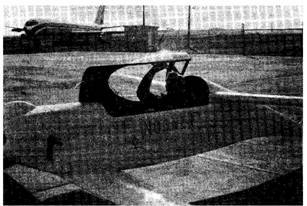 Garry LeGare reports that the combination is equivalent to a Cessna 170 in airfield performance. 4. Communications Antenna Kit - This kit contains materials to make and install a communications antenna in your Quickie and includes plans. It is available from Aircraft Spruce end Specialty Company, Fullerton, Ca. .....We have spent nearly two years now developing a smooth running organization to handle Quickie sales, deliveries, and support of homebuilders. .....The support function has entailed seminars around the country, trips to inspect homebuilderâs airplanes, as well as much time spent answering letters and talking on the phone. .....From the beginning, we have realized that a dealership network would yield the maximum level of support for each homebuilder, and thus provide safer airplanes, shorter building times, and more competent builders. In addition, a dealership network might help reduce costs by increasing the volume of sales. .....Thus far, we have been very cautious in approaching this type of program. To gain experience, we granted a distributorship to Garry LeGare for Canada, and we have discussed distributorships with companies in several other countries. However, we have refused all approaches from potential dealers in the United States until we could develop a cohesive plan and a smooth running program. .....We think that the time is appropriate to investigate setting up a dealership network in the United States. We are interested only in quality people who are prepared to establish a business supporting, as well as selling to our customers. .....We think that there is tremendous room for expansion in our business; those of you who watch the news realize that efficient, practical, low cost transportation and/or recreation will be not only a necessity during the next decade, but also the next big âgrowthâ area. Quickie Aircraft Corporation intends to lead the way. .....Since you have been following the Quickie program closely, we are giving you a head start on the rest of the United States. We have prepared a package describing the dealership program. If you are seriously interested in becoming a dealer, and have the financial position to support such an effort, please call so that we can send you a copy. .....If sufficient interest is shown, and qualified individuals and companies can be found, then we will proceed with setting up a dealership network throughout the United States. .....Quickie Aircraft Corporation will be growing over the next decade because it will have the products for tne next decade; we intend to be involved wherever there is a need for creative, efficient, and practical products. .....At the 1978 & 1979 Oshkosh, Wisconsin flyins, we had several sets of Quickie Construction Plans available for visitors to examine. In addition, individuals are welcome to visit our Mojave, California facility and to study the plans there. .....However, many visitor want the opportunity to examine the Quickie Construction Plans at length in the privacy of their own homes. This is inderstandable and we have the following arrangement to facillitate this. The.Quickie Construction Plans are available for $150.00. .....Purchasers of the plans are entitled to a $150.00 discount on the purchase price of the Quickie Aircraft Kit.